Available on double CD and as 16 bit MP3, Flac and Apple Lossless download. (16 bit download free with CD, check purchasing options). ‘Stranger Days’ is the brand new double album from the UK’s Symphonic Synth Music artist David Wright. It is an ambitious project containing new material plus reworked versions of a handful of older tracks. At times spacey, eerie, other worldly and ethereal there is still plenty of room for the emotive melodies we all know and love in David Wright’s music, as well as the exploration of some new sonic territories. ‘Stranger Days’ is a kind of retrospective in terms of influences and styles, and includes tracks inspired by Tangerine Dream, Edgar Froese, Klaus Schulze, Vangelis, Neuronium and Kitaro. 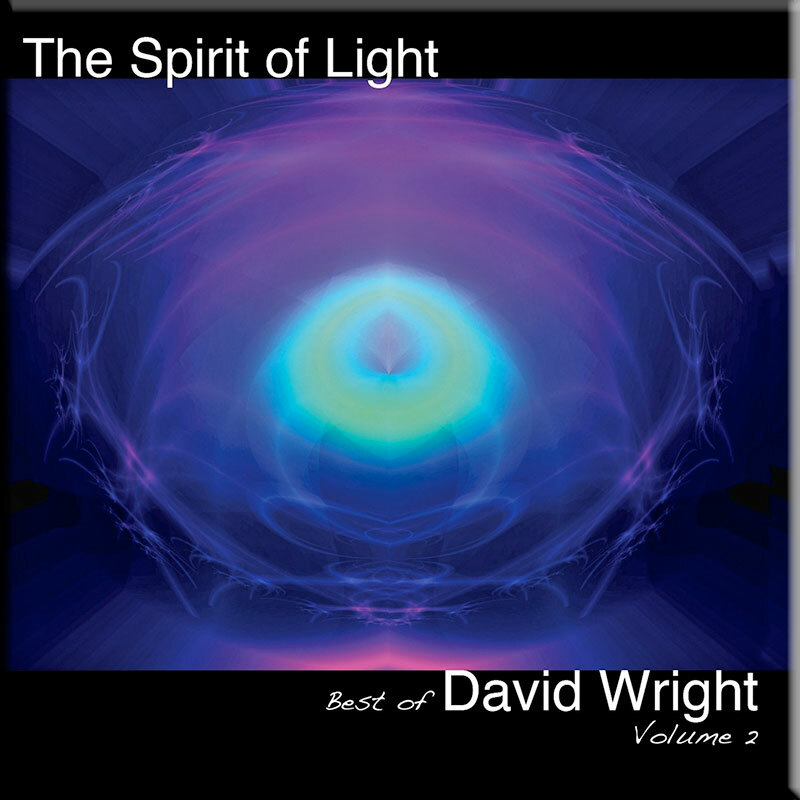 However, the music remains very much in David Wright’s melodious and thematic style, crossing electronic, new age, space rock and chill-out genres. It also includes music featuring Klaus Hoffmann-Hoock, Robert Fox, Carys and other musicians. ‘Stranger Days’ contains music that has originated over the past three decades, offering a broad, diverse and complete spectrum of the many sides to David Wright’s brand of “Electronic Music”. From the deeply reflective tones of his more atmospheric material to the huge, grandiose Vangelis inspired melodies – it is all here! The double CD comes with a 12 page booklet, the download version a 22 page booklet. It has been a labour of love, taking 18 months to complete. It incorporates music from live performances, studio sessions (in some instances overlooked and forgotten!) and reworked tracks and remixes.does contains a lot of new and previously unreleased music. The epic 60 minute title track, for example, is a studio re-imagining of new electronic music originally recorded live at E-Scape 2015 and previously unreleased studio recordings. There are other new tracks recorded between 2012 and 2018, some featuring the beautiful voice of Carys, alongside re-workings of older (some might say obscure?) tracks like ‘Colours of the Night’, ‘Glass Mountains’ (also featuring Carys) and more. It also features previously unreleased music with Robert Fox and Klaus Hoffmann-Hoock. This album is available to download and on factory pressed, replicated CD (double). Check out our FAQ page for more information. 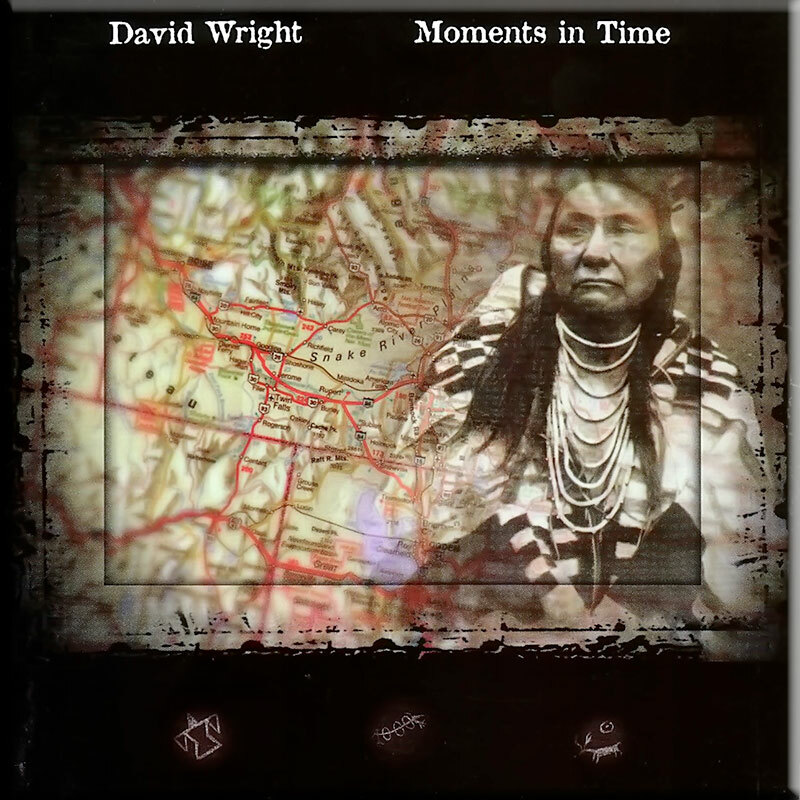 There is a true vibrancy to this latest release by master electronic composer David Wright. Stranger Days is a reflective look over the musical shoulder perhaps, but Wright seems to be somewhat revitalised, and that energy can be felt in this literally breath taking new double album. On this epic release, Wright embraces past, present and future, and musically the legions of electronic music fans will be baying at the door for the official release of this new collection of inspirational compositions. “‘Stranger Days’ was originally intended to be straightforward compilation, but it evolved into a journey; a journey through sound and styles reflecting the luminaries of the electronic music genre whose music I have loved since the early 1970’s and whose influences have shaped my music since I recorded my first album in 1989. So as a result, this album includes a lot of new and previously unreleased music alongside re-recordings of a handful of tracks. It has been a labour of love, taking 18 months to complete. It incorporates music from live performances, studio sessions (in some instances tracks that were overlooked and forgotten!) and reworked tracks and remixes. It also includes some collaborations with and input from friends and musical colleagues whose influences have helped evolve and mature my musical output over the years. I hope that they feel as enriched by the process as I have been. 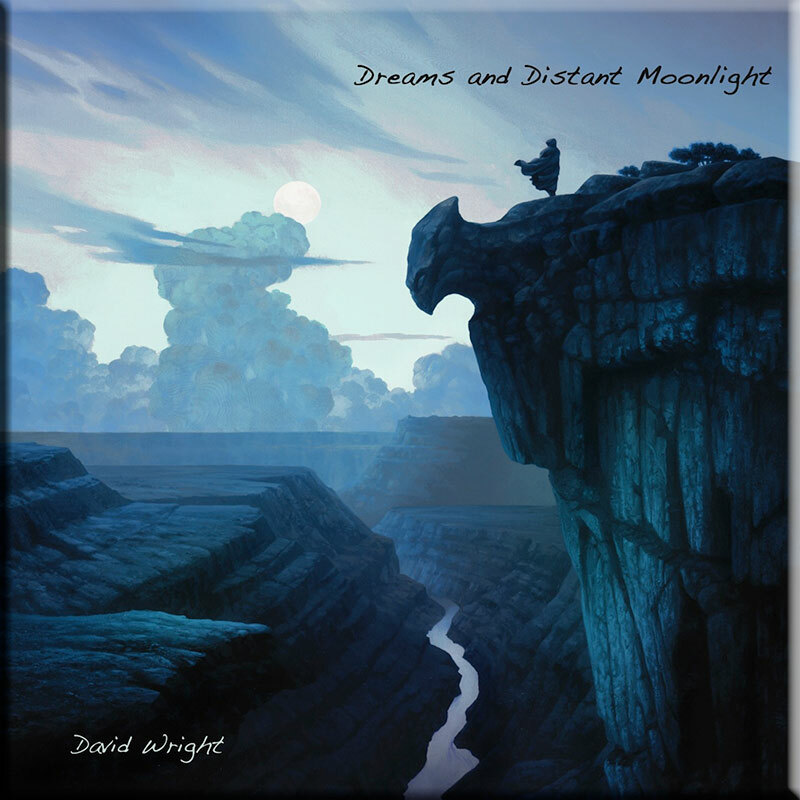 What makes a new David Wright album a highly anticipated event in EM circles? However, the friendly English musician has nothing to do with the Berlin School style for a long time. Moreover, his very melodious and symphonic approach, which I consider equal to that of Vangelis since the album Direct published in 1988, led him to flirt with the borders of a New Age worthy of the voracity of the media and the public American. Yet despite this approach, his albums follow each other and show much more depth than New Age. Expected for a long time, and repeatedly postponed, “Stranger Days” is still the umpteenth proof. Behind a flawless production driven by arrangements as intricate as highly stigmatized in the crystal of emotions, this imposing double album is in fact an improbable overview of the career of the greatest melodist in EM. Through some new pieces of music and long concept tracks that will amaze on a first listen and will seduce on each new one, also are hiding old titles and some recent ones that have been reworked to the full satisfaction of this artist who is behind this wave of the England School style in the mid-80’s. This new adventure begins with the slow astral flight of tender layers full of seraphic violins of “A Moments’ Contemplation”. Composed specifically like the desired opening of “Stranger Days”, the music reflects the spirit of its title with a contemplative vision composed with the idea of igniting the flame of our emotions from the first moments of this double album. It’s almost successful. Otherwise, it’s an excellent prelude to the superb and very catchy “Re-Connected” that was on the EP Walking with Ghosts (The Remixes), made in early June 2018. The titles “Walking with Ghosts Fantasy” and “Walking with Ghosts (Chilled remix)” were also part of this 40-minute auditory adventure. I wasn’t really sure, I don’t have the artwork beneath my eyes, but it seemed to me that I had already heard “Beyond Glass Mountains”. And that’s true since it’s a reworked version of Glass Mountains appeared on Ocean Watch. The version proposed here is more orchestral with new electronic effects and the sweet voice of Carys gives a depth to this title became more heavenly. A very New Age lunar ballad! “Krystal Halls” is a title composed with Klaus Hoffmann-Hoock which was interpreted by Code Indigo on the album E-Scape 2018. Now, let’s talk about the new music! “Always Tomorrow” is a sweet electronic ballad typical of David Wright’s signature. Beautiful and catchy, we can’t just not like its simplicity. Probably inspired by the Miramar years of Tangerine Dream, with its effects of sweet and distant voices and its bongos, “Once Upon a Dream” is also in the well-known David’s register with a nervous rhythm encircled by multiple synth textures including one with saxophone aromas which is charmer of senses. From the top of its 35 minutes and its 7 parts, the title-piece is a real monument of modern EM where rhythm, atmosphere and melody flirt in an environment where multiple sound effects are as synonymous of researches and as well dosed. A cosmic breeze lands on a sequencer which sculpts a slow and ominous pulsating rhythm. Sonic filaments whirl around this opening, drifting into a black hole where sound beings are formed. Intense, the slow procession is covered with a layer of tones that a synth pierces with its melodious approach. This synth goes on with its solos and harmonies in a second part whose rhythm takes more shape and turns into a mini Silver Scale of Tangerine Dream. Guitar riffs whip this very Berlin School rhythmic invasion that rolls like a train going up a hill. Tinkling and seductive percussive effects give tonus to this structure well decorated by solos that roll in loops and in effects that give it a slightly spicy velvet texture. We arrive at Part 4 and the rhythm is always hypnotic in a sonic uproar that keeps us awake and keeps our ears on the alert. Coated of orchestral layers a little more melodious, the part 5 keeps its rhythmic instinct which will gradually fade out in the ambiances of the 7th part. An epic title which shows that David Wright can be at ease as much as in the melodic structures easy to commercialize than in a very good Berlin School visited with a creative approach. We get a grip on ourselves and put the CD 2 in the player. That’s with a revamped version of an old David Wright’s classic that awaits our ears. Performed in concert, “Rysheara (2018 version)” evolves in electronic rock mode well played and where the synth of David Wright and the guitar of Lee Morant exchange very good solos. The identity of the original title, which appears on the Dissimilar Views album, is almost intact, even in its more rock approach and stretched out of more than 3 minutes. “Call to Me (2018 remix)” is already in its third remix since it was released on Beyond the Airwaves Volume 2. It’s still a light track, Carys’ voice goes very well with David Wright’s ethereal harmonies, very close to the borders of Enigma, just like “Melt Away”, and which also has some Lounge or Chill Out essences. “Harmonic Heaven (Parts 1 & 2)” bears the colors of its title with a slow exploration in an astral universe. Voices of nymphs from the heavens adorn a landscape of celestial ambiences that reach back to our ears with slow movements of violins, leading a semi-nervous and semi-controlled rhythm with a good mesh of sequences and percussions in the 2nd part. That remains a symphonic music that befits well in the territories of an ambient New Age. “Light Source (Parts 1 & 2)” is on the other hand more animated and loaded with good synth solos whose signature of David Wright is undeniable. The music switches to a good rock with an amazing play of percussions. The harmonies are woven by the continuous presence of solos and David puts down here and there effects that constantly charm the listening, including one where the movement of percussion stumbles. It’s very close to David Wright’s first albums. The second part exposes a violin texture in the solos and the rhythm breathes more of its heaviness with a good presence of the bass. Taken out, in order to have a sonic surgery, from the Marylinmba album back in 1998, “Colors of the Night” is another good electronic ballad with a synth whose violins and flute harmonies are very poignant. A unique ballad in the very romantic style of David Wright. Arranged with Robert Fox, “The Forgotten Symphony (Movements 1-4)” completes this massive work with a music gently animated by an ambient vision. The rhythm barely breathes with a bass sequences’ pattern and a bass line behind the barrage of violins where some fragile piano notes are preludes to harmonious passages, including this nice peasant flute with the bucolic charms of The Keep. Provided with beautiful winks to the great masters of EM, the music is based on intense orchestrations lying by a very emotional play of the Mellotron. And when it’s not this Mellotron flute that assails our emotions, it’s the piano that triturates them with excellent passages just as poignant. Original sound effects, such as the laughing laughter of a strange bird or the clatter of a deregulated clock, adorn this fascinating procession which ends with a clannish dance approach and a strong oriental fragrance. 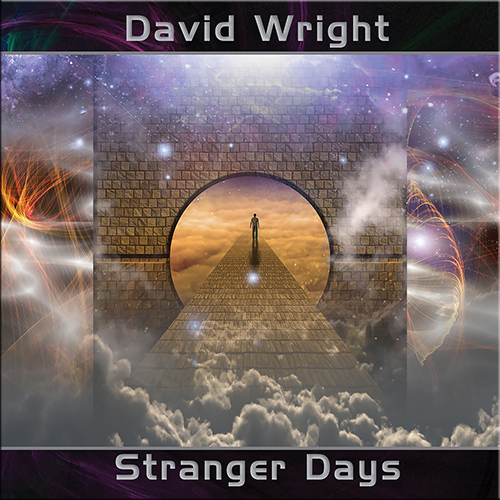 Monumental in all aspects, this “Stranger Days” presents David Wright’s nearly 30-year of career in a solid double album where all styles and years coexist inside the same artwork. Around 16 tracks and more than 2:30hrs of music, David Wright displays his immense melodic talent in a music which flirts bluntly between the borders of Easy Listening, New Age, England School and Berlin School with a little more creative zest in long structures, especially in “Stranger Days (Parts 1-7)”. Without being essential, the remixes are quite delicious to the ears. But aren’t those small details that make of a new album of David Wright a highly anticipated event in the circles of the EM? David Wright has been around the music industry since 1989 with his distinctive acoustic style of music which has led to a career of firsts; in particular the founding of the AD music label, co-founding of the electronic rock band Code Indigo and electronic duo Callisto, amongst the more than thirty years of pushing musical boundaries, experimentation and eventual acceptance of electronic music as a standalone genre, a genre which is growing exponentially. On his latest album Stranger Days, a title which could pay tribute to some of the amazingly unusual occurrences of today’s society, the work consisting of two CD’s is retrospective, reflective and encapsulates many of his styles which have emerged over the years. The first disc is almost completely Ambient which creates a subtle, atmospheric ambience which is all encompassing, relaxing and simply offers relaxation, a little bit of romance and that enticing, ever intriguing concept of the vast, unknown that is Space. Perfect for background music in that it is non pretentious, the music is simply there within the space, seeping gently into the mind and soul offering the enchantment that is music. From mellow and gentle, , to the slightly edgier style with haunting vocals as in Call To Me featuring Carys clear vocals, the album is an amazing journey down through the years, with many of the pieces gathered to form the collection rediscovered once again and remixed to suite todays audience. Ryshera and Colours of the Night, two such pieces both on the second disc, will be familiar to long-time fans. In so many ways the work took on a form of its own, as it began, in David Wrights words, ‘as a simple, straightforward compilation, but evolved as a journey’, a journey 18 months in a the making and a journey offering much in new directions, which in the field of electronic music, will be interesting to follow. A twelve-page booklet accompanies the music with the lyrics penned by Carys to Melt Away and Call To Me which, when sung in her clear voice, are almost ethereal and also offers a small insight into the album and the philosophy of David Wright. Over the two-disc collection there is something for everyone to enjoy, the work has a certain ‘je ne sais quoi’, that undefinable, undeniable touch of the Master at work, doing what he loves to do, create amazing soundscapes to enchant and enjoy.